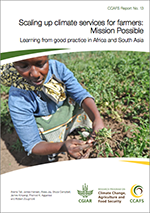 This report presents lessons learned from 18 case studies across Africa and South Asia that have developed and delivered weather and climate information and related advisory services for smallholder farmers. The case studies and resulting lessons provide insights on what will be needed to build effective national systems for the production, delivery, communication and evaluation of operational climate services for smallholder farmers across the developing world. The case studies include two national-scale programmes that have been the subject of recent assessments: India’s Integrated Agrometeorological Advisory Service (AAS) Program, which provides tailored weather-based agrometeorological advisories to millions of farmers; and Mali’s Projet d’Assistance Agro-meteorologique au Monde Rural, which provided innovative seasonal agrometeorological advisory services for smallholder farmers and 16 less mature initiatives operating at a pilot scale across Africa and South Asia. The case studies were examined from the standpoint of how they address five key challenges for scaling up effective climate services for farmers: salience, access, legitimacy, equity and integration. Three lessons address the salience challenge. First, rural climate services are enabled by institutional arrangements and investment in capacity that support sustained interaction between climate forecasters, agricultural organizations and farmers, and enable the passage from climate information to a climate service. Second, climate services must be delivered at a local scale to be relevant to farm decision-making. Third, a seamless suite of forecast, advisory and early warning products at a range of lead times enables farmers to manage evolving risks through the season. Many of the case studies created space for dialogue to bring together climate and agricultural expertise, and to allow the two communities of practice to work together towards translating raw climate information into useful farmer advisories; before later formalizing these forums for dialogue into institutional frameworks, as was the case with Mali’s multi-disciplinary working group. This structure emerges as an effective format to convene multiple types of expertise across climate and agricultural research needed to produce a climate service for farmers. Addressing the legitimacy challenge requires giving farmers an effective voice in the design, production, and evaluation of climate services. This includes expanding the boundary of climate science and knowledge production to include agricultural knowledge, as well as the knowledge of farmers themselves, to produce a service they can use. In this area, integration of meteorological information with local indigenous knowledge has been suggested to foster trust, local relevance and use, but rigorous evidence is still lacking. Starting with farmers’ knowledge base on climate and their existing predictors of climate variability, remains an important entry point to engage farmers in a meaningful dialogue on climate prediction and use of climate and weather forecasts. Regarding the access challenge, face-to-face dialogue between farmers and service providers is an effective way to communicate historic and predicted seasonal climate information, as well as associated probabilities. Face-to-face seasonal workshops can be combined with Information and Communications Technologies (ICTs) and rural radio programmes to enhance access to climate services at shorter intervals. Participatory approaches are essential to identify the best combinations of communication channels and information content for a given context. There is increasing evidence that equity is a general challenge when scaling up climate services beyond a pilot scale. Proactive targeting of women and other socially marginalized groups can help ensure gender and social inclusiveness in the design and delivery of climate information services for rural communities. Case studies reviewed also underscore the importance of participatory action-research (PAR) approaches in determining the needs of specific farmers within a community, and giving these farmers a voice in how their needs are satisfied. Because climate service needs are highly location-specific, local participation is needed to identify local needs and ensure appropriate tailoring of climate information to meet them. PAR approaches are found to improve uptake, sustainability and quality of the service. Although the case studies we reviewed generally did not go far in addressing the integration challenge, we recognize that impact on farmer livelihoods at scale will depend on synergies between climate services and interventions within the broader national agricultural and rural development enterprise. We conclude with a set of guidelines for climate service design that we recommend should be part of any effort to develop climate services at a national scale that seek to serve smallholder farmers. First, involve farmers in the co-design, co-production and co-evaluation of climate services. Second, establish partnerships that bridge the gap between climate, agricultural research and farmers. Third, exploit scalable communication channels to reach “the last mile.” Fourth, continuously assess need to improve service delivery. Finally, proactively engage, and target the needs of the most vulnerable and marginalized, particularly women, from the onset. Opening spaces for co-production of climate services has proven a lengthy process, fraught with the challenges of institutional change; however it is a process that will need to be supported and accompanied as countries move to create their frameworks for climate services at the national level under the Global Framework for Climate Services (GFCS). Blog: How can we turn climate information into action?